Fishing has been hot across middle and east Tennessee. The weather has been somewhat unpredictable as of late, but that hasn’t hurt the fishing any. On our recent trips, we are seeing lots of fish as well as some big fish. Some of those we have seen in the net which is always good! If you are heading for the Smokies any time soon, expect the lighter colored bugs of late spring to be kicking in well. Sulfurs, Light Cahills, and Pale Evening Duns can be expected, particularly on foul weather days. Caddis and stoneflies are hatching as well, especially on the warmer days. This is probably my favorite time of year in the Park if dry fly fishing is my goal. The entire Park is fishing well from low elevation brown and rainbow trout water, to the high elevation brook trout streams. A good searching rig in between hatches now is a #14 Yellow Stimulator with a #16-#20 bead head Pheasant Tail nymph dropped underneath. Yellow Neversink Caddis and Green Weenies are also good choices. Of course, matching the prevailing hatch is always a good idea. Check out the hatches page to learn more about the bugs of the Smokies. This is where I’ve been spending most of my time as of late. While you shouldn’t expect big fish every trip, the opportunities are certainly there. In between the big fish, there are plenty of other fish to keep anglers entertained. 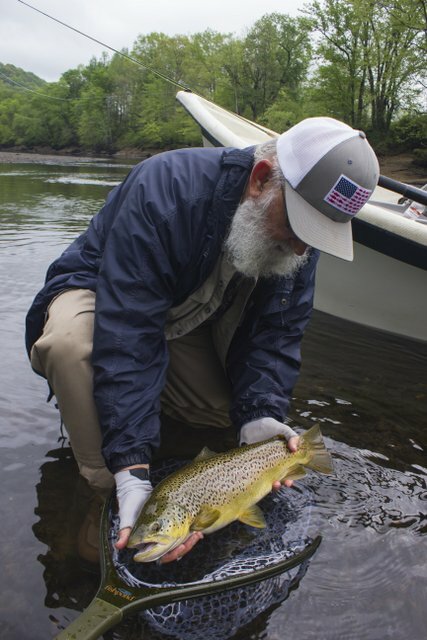 On a six hour float last Sunday, I had two anglers boat between 70 and 80 trout. Several large fish did the long distance release routine, but of course that is to be expected. Those fish don’t get big by being pushovers. This week has been good although now we are back to high water again. On Tuesday, a previously scheduled smallmouth and musky float turned into a Caney Fork float when our smallmouth streams started spiking up due to overnight rain. That was okay because my one angler caught close to 50 trout including a hog brown trout. This fish was all the more impressive because of the fact that it came on a #18 midge and 6x tippet. Talk about nerves of steel to fight and land this beast! The smallmouth and musky streams are up and down. In fact, flows were getting a little low for floating until the recent rain. That push of water and more forecast for this weekend should extend the smallmouth bass and musky float season a bit longer this year. Smallmouth are hitting just about anything right now so there is no need to get fancy. Basic Clouser Minnows in a variety of colors are working very well. When that gets slow try crawdad patterns. We should see some topwater action heating up when the weather warms up just a little more. Golden stoneflies and Isonychia mayflies are hatching on many of these streams now as well. Nymphing big stonefly nymphs can certainly produce some quality bass. Musky are in the spawning season. Many fish have already spawned but not all of them. If you find them spawning, please leave them alone to do their thing. These fish are never as plentiful as you might think, so it is essential that they are able to reproduce successfully each year. Nature throws enough at them without us making things more difficult. If you are heading out to fish for them, expect aggressive fish as they come off of the spawn. I don’t have any dates left this month and May is nearly full. If you are wanting a guided trip, book as soon as possible. Currently, the following dates are still left although most of them are already tentatively being discussed as we speak. May 2, 5, 8, 19, 22, 30 and 31 are all that’s left. The 5th and 19th have some limitations on trip location and length. If you want one of these, please let me know in the next day or two.